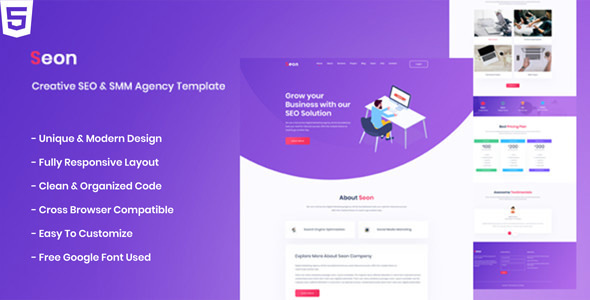 Seon – Creative SEO & SMM Agency HTML Template is a highly suitable for any SEOCreative SEO & SMM Agency Business Website. It has nice, clean and user friendly design. The HTML is designed on grid system and can be easily converted into joomla, WordPress etc. All files are well organized and named accordingly so it’s very easy to change any and all of the design. It’s all that you looking for your SEO & SMM Agency HTML Template Website.You can easily edit the HTML file and make necessary adjustments. SEON template coded with beautiful and clean codes! Some powerful HTML files 100% valid W3 web standards.